During the past two decades, studies of the Aso volcano in Japan have improved our understanding of the shallow hydrothermal system that exists beneath the active crater of this volcano. Detailed knowledge of the subsurface structure of this volcanic edifice is essential for developing a better understanding of the behavior of the volcanic fluids and of the triggering mechanism of volcanic eruptions. 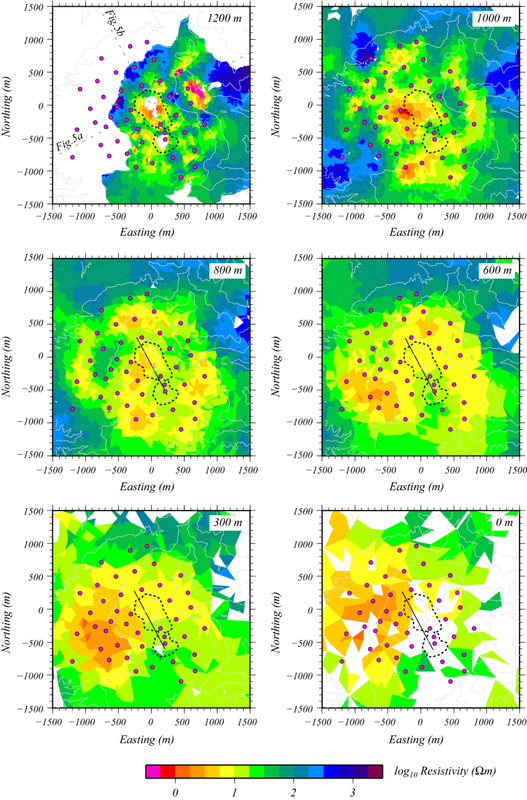 Here, we report a three-dimensional (3-D) electrical resistivity model for the active crater of the Nakadake central cone of Aso volcano using audio-frequency magnetotelluric (AMT) data obtained during 2004–2005. The AMT data were collected at 43 sites on a grid (distance between grid points: ~ 300 m) around the crater. However, as yet, only two-dimensional sectional resistivity models have been generated for this survey area. Using 3-D inversion, we obtain a resistivity model that shows similar characteristics to those of the 2-D models. A highly conductive zone is observed beneath the active crater down to a depth of approximately 300 m. Based on the recent findings regarding the shallow hydrothermal system of the volcano, we interpret this conductive zone to have been formed by highly conductive acidic fluids filling a fractured region. This view modifies the past interpretation made on the 2-D models and promotes understanding of fluid behavior beneath the active crater. The online version of this article ( https://doi.org/10.1186/s40623-019-1017-7) contains supplementary material, which is available to authorized users. Knowledge on the subsurface structure is essential for a better understanding of the volcanic activity. In particular, the triggering mechanism and/or the style of eruptions greatly depend on whether the fluid within the volcanic edifice is involved or not (e.g., Schmincke 2004). Distribution and behavior of the fluid within a volcano is regulated by the hydrothermal system developed in the shallow subsurface, and electrical resistivity has often been used to determine its characteristics (e.g., Pellerin et al. 1996). This paper provides basic information on the structure of hydrothermal system from the detailed resistivity distribution beneath the active crater of Aso volcano. Aso volcano in southwestern Japan (Fig. 1a, b) has registered repeated eruptions from the first crater of Nakadake, one of the volcano’s central cones, over the past 80 years. The volcanic activity is known to have the following cycle (e.g., Sudo et al. 2006). During a quiet period, the active crater (first crater) is filled with hot hyperacidic water (water temperature > 50 °C, pH < 1.0; Ohsawa et al. 2010), forming a crater lake. As the volcanic activity increases, the crater lake gradually dries as a result of heat supplied from the deep subsurface, and a red-hot glow becomes visible in the bottom or wall of the crater. Then, the vent opens and phreatic eruptions or mud eruptions occur. After repeating the Strombolian-type eruption for a period, the volcano again forms a crater lake. The time scale of this activity cycle is different in each case. Kanda et al. (2008) presumed that some mechanism of accumulating energy for an eruption must be present at a shallow depth beneath the crater in order to repeat such an activity cycle and that such a mechanism should be detectable physically as a characteristic subsurface structure. In this context, the authors performed audio-frequency magnetotelluric (AMT) surveys on Aso volcano in 2004 and 2005. The data were acquired on a grid around the Nakadake crater system, but only two-dimensional (2-D) cross sections along multiple lines crossing the crater were constructed because it was difficult to perform three-dimensional (3-D) analysis at that time. Kanda et al. 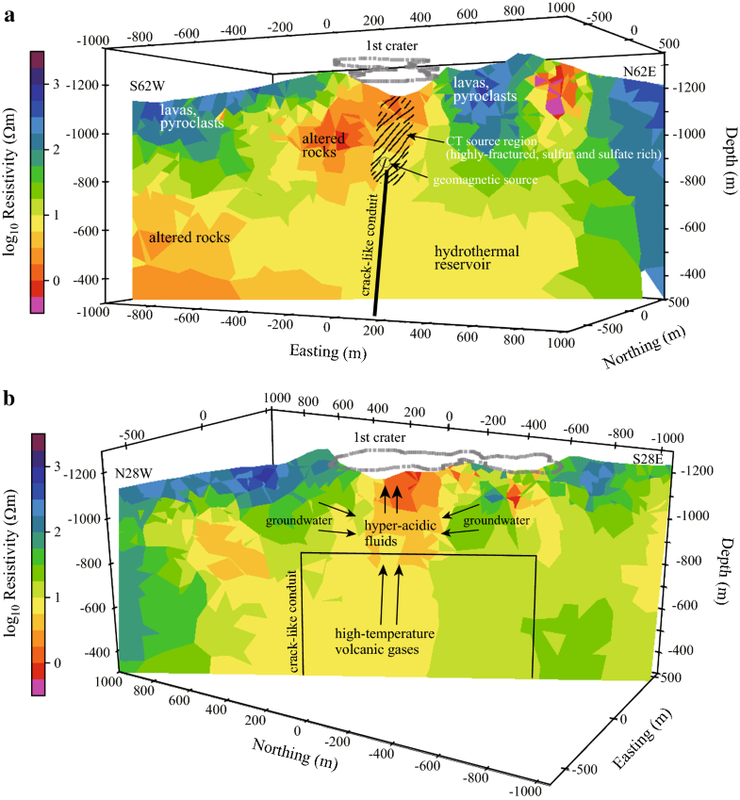 (2008) found that the volcanic edifice generally showed resistivities lower than 30–50 Ωm, with further conductive portions being found at elevations of 800–1100 m below the first crater and extending to the third crater, and at elevations ranging from − 400 to 800 m. In contrast, relatively high resistivities were detected under the fourth crater, which is not presently active. Kanda et al. (2008) discussed this difference in resistivity structure in terms of spatial variations in recent and present volcanic activity. Several recent studies of Aso volcano have investigated the crater lake, one of the surface manifestations of the hydrothermal system. Miyabuchi and Terada (2009) analyzed lacustrine sediments collected from the bottom of the crater lake and found that the total sulfur content of the sediments was extremely high. The sediments contained small amounts of unaltered fresh glass, suggesting that magma had been released even during apparently quiet periods. Terada et al. (2012) studied the hydrothermal system of the volcano by investigating the heat and mass balances of the crater lake. Fluids composed of a mixture of groundwater and high-temperature volcanic gases ascend through a crack-like conduit, which was inferred to be a source of long-period tremors (Yamamoto et al. 1999), and are continuously supplied to the crater bottom even during quiet periods. Shinohara et al. (2018) analyzed salt shell fallout around the crater during the 2014 ash eruption and surmised that a hydrothermal system was present in the vicinity of the conduit even during the period of magmatic eruption. As mentioned above, new information regarding the hydrothermal system has been generated since the publication of the 2-D resistivity structure models in 2008. Thus, it is timely to update the subsurface images around the crack-like conduit beneath the active crater (first crater) of Aso into a 3-D model by reanalyzing the AMT data obtained near the Nakadake crater system in 2004 and 2005. The objective of this study is to construct the 3-D resistivity structure model and interpret it based on the recent information. AMT surveys were conducted around the Nakadake crater system in 2004 and 2005. Details of those campaigns and data processing are described by Kanda et al. (2008). Here, we briefly summarize the survey scheme. Figure 1c shows the location of the measurement sites used in this study, which are distributed on a sub-grid with a spacing of ~ 300 m. Of the data obtained at 44 AMT measurement sites, we used the data (1–10,000 Hz) at 43 sites, excluding one site where contamination by artificial noise was recognized even in high-frequency bands. High-quality data were generally obtained at frequencies higher than 5 Hz, but some data show the influence of noise caused by nearby buried communication cables or by sightseeing ropeways installed on the volcanic edifice. These affected data were not used during subsequent screening and analysis. The magnetotelluric impedance and the geomagnetic transfer function (tipper) were estimated from the measured electromagnetic field data, and a remote-referencing technique (Gamble et al. 1979) was applied to reduce local noise. This processing allowed us to use data with frequencies of > 2 Hz at many sites. There are three measurement sites within the crater system, around which there is steep topography. Therefore, we performed 3-D inversion with a finite element code utilizing an unstructured tetrahedral mesh that can incorporate topography into a resistivity model (FEMTIC; Usui 2015; Usui et al. 2017). This code has been applied successfully to volcanic areas at Asama volcano (Usui et al. 2017) and Hakone volcano (Yoshimura et al. 2018). The full components of the impedance tensor and tipper were used as the input data for inversion. The error floor was set to 5% for impedance and 10% for tipper. The number of frequencies used for computation was 16, ranging from 5200 Hz to 2 Hz, which was sampled so as to yield approximately equal intervals on the logarithmic axis among the 40 frequencies at which the response function was calculated. Therefore, the total number of input data was 43 (sites) × 16 (frequencies) × 12 (real and imaginary parts of 4 impedance components and 2 tipper components) = 8256. The calculation domain was set to 40 km in both the east–west and north–south directions, centered on Nakadake first crater, and 60 km in the vertical direction. The initial model had a 100 Ωm uniform subsurface, and topographic variations were incorporated into the model. 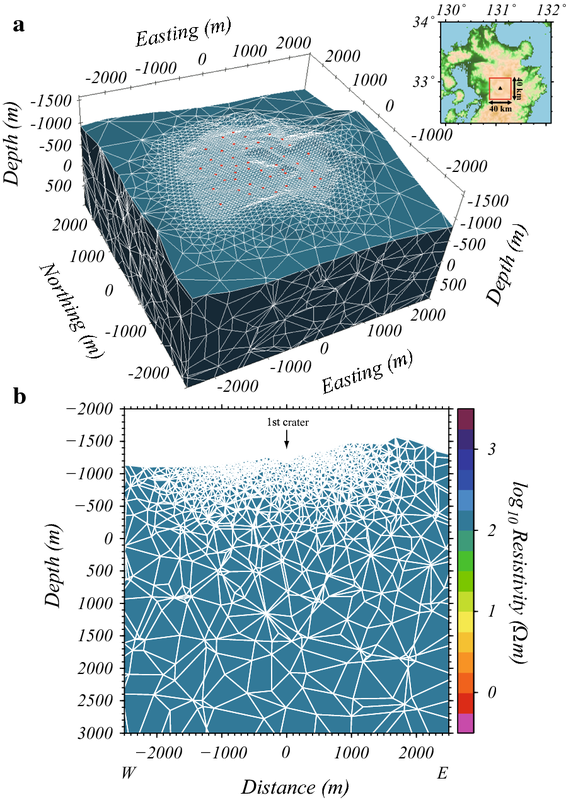 The ocean with conductive seawater was not modeled because the maximum skin depth of the data assuming a 1000 Ωm uniform subsurface is much smaller than the distance from the surveyed area to the nearest coastline. The resistivity of the domain above the ground surface (air layer) was fixed at 109 Ωm. Two types of digital elevation data were used: The 10-m-mesh data of the Geospatial Information Authority of Japan was used for the area within 10 km of the first crater, and ETOPO-1 (Amante and Eakins 2009) was used for areas farther from the crater. An interpolated elevation was assigned to each surface node for the two datasets. The mesh size was set to smaller values toward the center of the calculation area and toward the ground surface and was set even more finely near the measurement sites (Fig. 2). In other words, we assigned the edge lengths of a tetrahedral element so as to become shortened as approaching the center of the survey area. As a result, the total number of tetrahedral mesh cells was 137,598 and the minimum size of the mesh was about 40 m along the ground surface. In FEMTIC, resistivity inside a tetrahedral mesh is assumed to be uniform. A single tetrahedron has a single resistivity value, but some of the adjacent tetrahedrons were grouped (forming a resistivity block), and the same resistivity value was assigned to that block. Consequently, the number of resistivity blocks was 10,814, which was fixed throughout the inversion. During inversion, the objective function, which is a linear combination of the misfit term between the observed data and the model responses, the roughness term of the model, and the distortion term, is minimized (Usui 2015). These three terms are combined by hyper-parameters α2 and β2, where the roughness term and the distortion term are multiplied by α2 and β2, respectively. Thus, we examined seven values (0.1, 0.3, 0.5, 1.0, 3.0, 5.0, and 10.0) for α2 and four values (0.01, 0.03, 0.1, and 0.3) for β2. That is, inversion was performed for a total of 28 combinations of hyper-parameters. The determination of α2 was performed under the L-curve criterion, as done previously (e.g., Patro et al. 2005; Usui et al. 2017). For the seven models obtained by changing α2 with a given β2 value, the data misfit was plotted against the model roughness, and the model that plotted nearest the inflection point of the L-curve was adopted as the preferred model. Regardless of the β2 value, the L-curve showed that the model with α2 = 0.5 was the preferred model. The L-curves for four β2 values are shown in Additional file 1: Fig. S1. Of the four models with α2 = 0.5, the model with β2 = 0.03 yielded the minimum root-mean-square (RMS) misfit, so this model (α2 = 0.5, β2 = 0.03) was adopted as the final resistivity structure model for Aso volcano. Starting from the initial model (RMS misfit = 7.45), the final model was obtained by the ninth iteration (RMS misfit = 0.88). The fitting of the final model to the data is shown in Fig. 3 for three representative frequencies. Figure 3 shows the elliptical representation of the phase tensor (Caldwell et al. 2004) calculated from all four components of the impedance tensor and the induction arrow (Parkinson 1962), which is a graphical representation of the two tipper components. The final model performs well in explaining all data from high to low frequencies. Fits represented by apparent resistivity, phase, and tipper for all frequencies used for the inversion are shown in Additional file 1: Fig. S2a–e. Figure 4 shows horizontal sections of the final 3-D resistivity model for six elevations. The figure shows only those meshes that have higher sensitivity and sensitivity density (Usui 2015) than the threshold values, which were determined based on the frequency distribution (Usui et al. 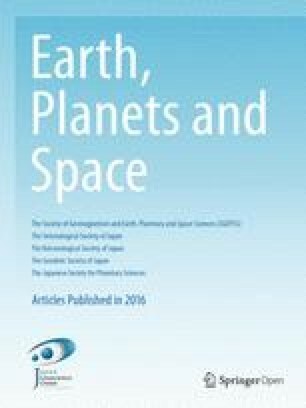 2017; Yoshimura et al. 2018). Histograms of the two quantities and their thresholds are presented in Additional file 1: Fig. S3. In the horizontal section at 1200 m elevation, highly conductive zones are observed around the eastern margin of the survey area and within the first crater. For the conductor in the eastern margin of the survey area, although we examined various data, the cause has remained unknown and we will not mention it further in this paper. Although low resistivities are also distributed around the margin of Nakadake crater system, high resistivities of up to several hundred ohm-meters are widespread outside the crater. High resistivities are imaged at ~ 1200 m in elevation in the northwest of the crater, which are likely to correspond to the recent pyroclastic cone (Na in Fig. 1c) and the tuff cone (Nc) near the surface. In the section at 1000 m elevation, although resistive zones probably corresponding to the lava flow of Nakadake (Ny) can be recognized, low resistivities of 10–50 Ωm occur widely over the surveyed area. In particular, there is a low-resistivity zone of ≤ 5 Ωm extending westward from the first crater, and a similar small zone is located to the southwest of the fourth crater. These two conductive zones are connected to each other to form a single conductive zone of ≤ 10 Ωm in the section at 800 m elevation, in which the whole survey area exhibits resistivities of ≤ 50 Ωm, and conductive zones of ≤ 10 Ωm are found in four locations. In the section at 600 m elevation, the resistivity is low overall, and resistivity regions of ≤ 10 Ωm occupy the majority of the survey area. One of these low-resistivity regions shows resistivities of ≤ 5 Ωm slightly west of the first crater, whereas a region of relatively high resistivity (10–30 Ωm) extends southward from the fourth crater. This pattern becomes more prominent in lower-elevation sections. At an elevation of 300 m, a region with relatively high resistivities (10–30 Ωm) spreads from the south to the east of the fourth crater, and the remainder of the section generally shows resistivities of ≤ 10 Ωm. In particular, a highly conductive region (resistivity of ≤ 5 Ωm) is located to the west of the first crater. A similar pattern can be recognized at an elevation of 0 m, although about half of the mesh shows no sensitivity. These characteristics indicated by the 3-D resistivity model are consistent with those shown by the 2-D cross-sectional models of Kanda et al. (2008), and some of which were examined for their presence by performing sensitivity tests. Details are shown in Additional file 2: Appendix A. The final 3-D model exhibits a heterogeneous resistivity structure beneath the active crater of Aso volcano. Generally, the surface layer shows high resistivity caused by recent ejecta, whereas low resistivities are widely distributed beneath that layer. However, the resistivity structure is not uniform: the region to the west of the first crater shows low resistivities, whereas the region to the south and east of the fourth crater shows relatively high resistivities. Here, we discuss the relationship between the locations of various anomalies (as estimated from other geophysical observations) and the underground structure and consider the characteristics of the hydrothermal system in the region beneath the active crater. 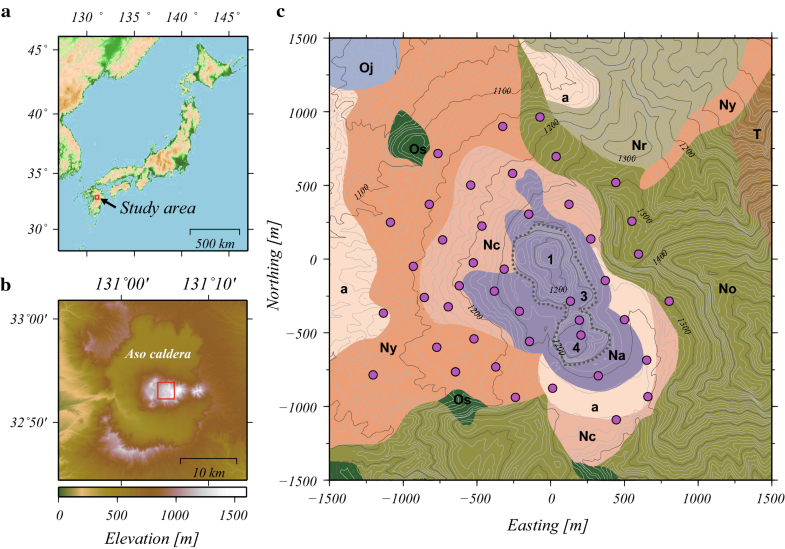 Seismological studies have proposed a magma supply system for Aso volcano extending from a magma reservoir located at a depth of ~ 6 km about 3 km west of the Nakadake crater system (Tsutsui and Sudo 2004; Sudo et al. 2006). The crack-like conduit (shown as a solid line in Fig. 4) constitutes the uppermost part of this magma supply system and inferred to be filled with a gas-rich fluid (Yamamoto et al. 1999). The 3-D model shows low resistivities of ≤ 10 Ωm at elevations where this crack-like conduit is proposed (0–800 m above sea level), although clear features suggesting the existence of the crack are not obtained. We attribute this conductive zone to the presence of a water-rich zone and altered rocks, as proposed by Kanda et al. (2008). A highly conductive region is imaged in the deep part of the west side of the Nakadake crater system, which is probably related to the seismologically inferred magma supply system through which high-temperature volcanic gases are supplied from the west. The expected higher temperatures beneath the western side are likely to cause a zone of intensive hydrothermal alteration (Kanda et al. 2008). Low resistivities of several ohm-meters are estimated in the final model to extend from around the upper edge of the crack-like conduit to the bottom of the first crater (from about 850 to 1200 m in elevation; Figs. 4 and 5). Kanda et al. (2008) inferred that this highly conductive region was a hydrothermal reservoir capped with hydrothermally altered rocks of high electrical conductivity and low hydrological permeability. Those authors considered that this capped reservoir acts as a preparation zone for volcanic explosions. Miyabuchi and Terada (2009) reported a high sulfur content (74% by weight) in the lacustrine sediments. This sulfur was present as elemental sulfur, gypsum, and anhydrite. Sulfur is a typical insulator, and the two sulfates are generated in highly acidic environments and exhibit high electrical resistivity (e.g., Guinea et al. 2012). In such highly acidic environments, smectite, which is a typical clay mineral showing low resistivity and low permeability (e.g., Pellerin et al. 1996), is considered to be virtually absent. A similar example is found in the Jigokudani geothermal area of Tateyama volcano (Japan), where AMT measurements imaged high conductivities in the near-surface; however, the soil contained elemental sulfur and similar precipitates generated in a highly acidic environment (pH ~ 1), and smectite has not been detected at Jigokudani (Seki et al. 2016). Several kinds of tremors are reported to occur around the upper edge of the crack-like conduit and are considered to be a result of fluid movement (e.g., Mori et al. 2008). A study of continuous tremors (CTs) has shown that their sources are located between the upper part of the crack-like conduit and the crater bottom (e.g., Takagi et al. 2009). Ichimura et al. (2018) estimated the sources of CTs observed during the eruptive activity of Aso volcano from December 2013 to January 2014. The CT sources were distributed in a cylindrical shape with a similar diameter to that of the first crater from the crater bottom to a depth of ~ 400 m. As this source region corresponds to the low-resistivity zone estimated by Kanda et al. (2008), Ichimura et al. (2018) concluded that the CT source region is composed of a fracture network that acts as a supply path for fluids ascending from the crack-like conduit to the crater bottom. It was also inferred from other data that a certain amount of fluids is present beneath the first crater (Terada et al. 2012; Tanaka 1993). Terada et al. (2012) found that the fluid supplied to the crater bottom was a mixture of high-temperature volcanic gases and groundwater at shallow depths. It has also been suggested from geomagnetic observations that groundwater enables heat transfer in the thermally demagnetized source at 200–300 m below the crater bottom (Tanaka 1993). Based on the above results, the high-conductivity zone that extends from the crack-like conduit to the crater bottom is considered to be due mainly to the high electrical conductivity of the acidic hydrothermal fluid. Although the electrical conductivity of lake water has not been measured so far, it is expected to have a considerably high value due to its high ion concentration and low pH (e.g., Ohsawa et al. 2010). Byrdina et al. (2018) estimated the theoretical electrical conductivity of spring waters sampled at Papandayan volcano (Indonesia) to be extremely high values of 20–25 S/m from their chemical compositions and pH values. Using the compositional data shown in Miyabuchi and Terada (2009), we estimated the electrical conductivity of lake water in the Nakadake first crater to be ~ 40 S/m by the same method (details are shown in Additional file 2: Appendix B). Although this exceptionally high value is likely to be an overestimate as pointed out by Byrdina et al. (2018) for waters of high ion concentrations, the order of magnitude would not be different because high values exceeding 10 S/m were sometimes measured for hot-spring waters in the volcanic area (e.g., Seki et al. 2016). If such high-conductivity fluids infiltrate the inter-connected fractures, the influence of sulfur or sulfates with high resistivity to the bulk conductivity of rocks can be neglected (e.g., Guinea et al. 2012; Byrdina et al. 2018). There is no evidence that altered rocks with high electrical conductivity, as proposed by Kanda et al. (2008), occupy the region beneath the crater bottom. The existence of a sulfur-rich region immediately below the crater bottom is commonly reported in highly acidic crater lakes (e.g., Delmelle and Bernard 2015). Christenson et al. (2010) inferred that a region rich in elemental sulfur was present around the conduit and the bottom of Ruapehu crater lake (New Zealand), where a phreatomagmatic eruption occurred in 2007, and contended that the sulfur acted as a low-permeability seal. We consider that a similar situation exists at the active crater of Aso volcano (Fig. 5). Although such resistive minerals are precipitated at Aso, the intermittent high flux of high-temperature gas supplied through the crack-like conduit could break the seals formed around the fractures, which might be observed as the occurrence of repeated tremors. As a result, a highly fractured region with high conductivity is considered to be present immediately below the first crater. 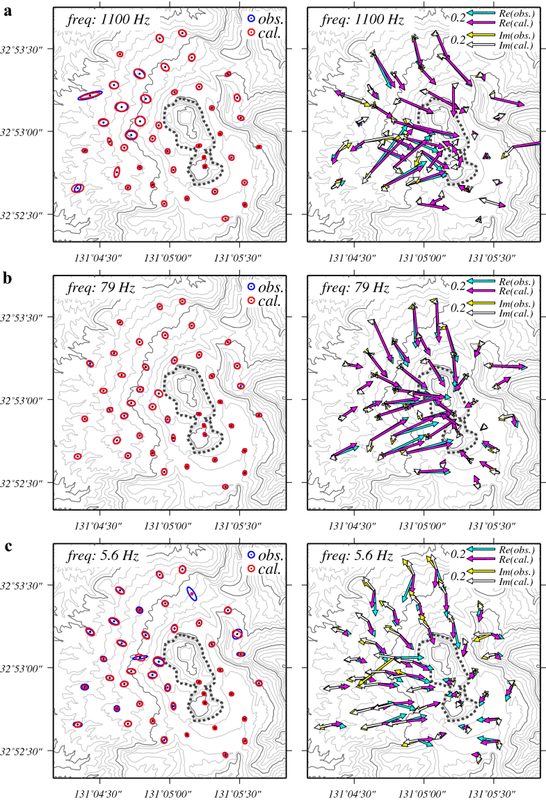 In this study, AMT data acquired between 2004 and 2005 were reanalyzed using a recently developed 3-D inversion code to estimate the detailed shallow resistivity structure of Aso volcano. The obtained resistivity model shows similar characteristics to those of the 2-D cross sections presented by Kanda et al. (2008). In the previous 2-D analysis, it was not possible to estimate the influence of 3-D topography. However, in the present study we incorporated detailed topography into the model and therefore the obtained resistivity structure around the crater is more reliable. Combining our results with recent findings regarding the hydrothermal system of the volcano, we infer that the region from the upper end of the crack-like conduit to the bottom of the first crater exhibits high conductivities because this region is highly fractured and filled with acidic hydrothermal fluids. Therefore, we consider that the hydrothermal system beneath the active crater of Aso volcano effectively forms an open system. Although sulfur and sulfate minerals precipitated around the fluid pathway act as seals reducing permeability, those seals are probably broken with causing several kinds of tremors by the continuous fluid supply from the crack-like conduit. When the volcanic activity becomes active caused by the increase in fluid flux from the deep, this system would virtually work as a closed system to lead to eruptions. WK led the AMT acquisition, data analysis, and 3-D modeling. MU, ST, and HI played leading roles in the field work. WK, MU, and ST participated in the scientific discussions. All authors read and approved the final manuscript. We thank all participants of the field survey (Y Tanaka, M Nakaboh, H Hiura, T Mori, S Yoshikawa, S Goto, and Y Okada). We also thank Y Usui, for the use of his 3-D inversion code. The constructive comments provided by the two reviewers (Paul A. Bedrosian and anonymous) and the Lead Guest Editor (Takahiro Ohkura) were highly helpful to improve the manuscript. Numerical calculations were performed with the TSUBAME3.0 supercomputer at the Tokyo Institute of Technology. Most of the figures were prepared using Generic Mapping Tools (Wessel and Smith 1998). All data are presented as diagrams in Additional file 1: Figure S2. The data that support the findings of the present study are available from the corresponding author upon request. The original AMT dataset was acquired under a Grant-in-Aid for Scientific Research on Priority Areas (No. 14080205: Y Tanaka). This study was partially funded by the MEXT Integrated Program for Next Generation Volcano Research and Human Resource Development (Y Morita). Additional file 1: Fig. S1. Plot of data misfit versus model roughness. Various models calculated with several values of hyper-parameters (α2 and β2) are shown. This plot was used to determine α2 under the L-curve criterion. Fig. S2. Comparisons of the observed data with the results of the final 3-D model. Comparisons of the apparent resistivity and the phase of the (a) Zxx component, (b) Zxy component, (c) Zyx component, (d) Zyy component, and (e) tipper component. Red dots with error bars indicate observed data, and green lines indicate model results. Fig. S3. Histograms of (a) sensitivity density and (b) sensitivity. Histograms for meshes within the core region and within the whole calculation domain are shown by red and green bars, respectively. The core region was defined as a cubic region ranging from −1000 to 1000 m in the N–S and E–W directions, and from − 2000 to 0 m in the vertical direction, which covers most of the AMT survey area. The vertical dashed line in each histogram indicates the lower limit of the relatively sensitive mesh (10−6.4 for sensitivity density and 100.5 for sensitivity), which was determined so as to contain most of the mesh of the core region. Additional file 2: Appendix A. Sensitivity test. Appendix B. Estimation of the electrical conductivity of lake water.